Autumn is coming really fast and by now, you're probably thinking of where you can have a good view of one of the most colorful season in Korea. 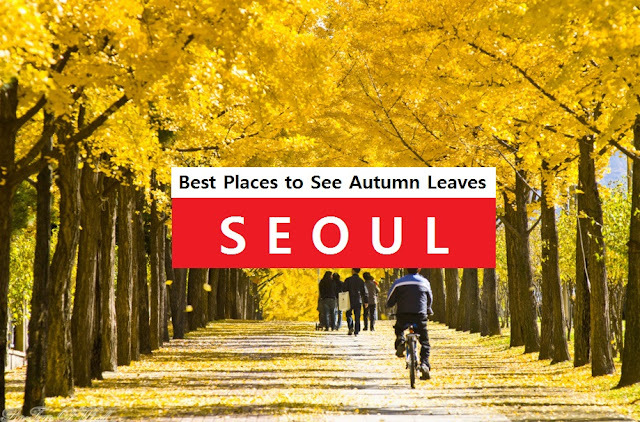 Here's our top 3 picks for the best places to see autumn leaves in Seoul. Nami Island was formed as a result of the construction of Cheongpyeong Dam. This half moon-shaped isle is home to the grave of General Nami, who led a great victory against the rebels in the 13th year of the 7th king of the Joseon Dynasty, King Sejo. 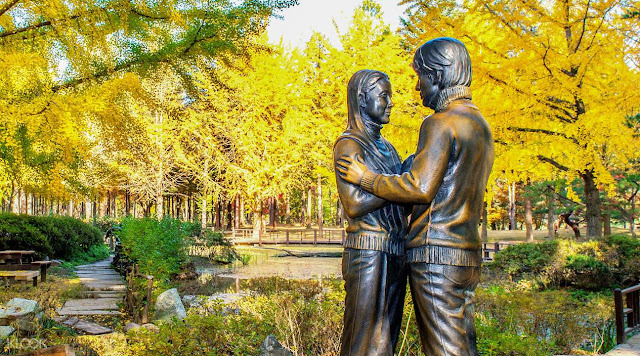 A trip to Korea is not complete without a visit to Nami Island, especially in Autumn. A stroll down the lanes of yellow trees will leave you in awe. Aside from its perfectly aligned trees and peaceful and romantic ambiance, the island became popular among tourists as Nami Island was one of the main filming locations of Endless Love, Winter Sonata. Take the shuttle bus from Gapyeong Station. Also known as Jeongdong-gil road, Deoksugung Doldam-gil (Deoksugung Stone Wall Road) is a popular place for romantic strolls. 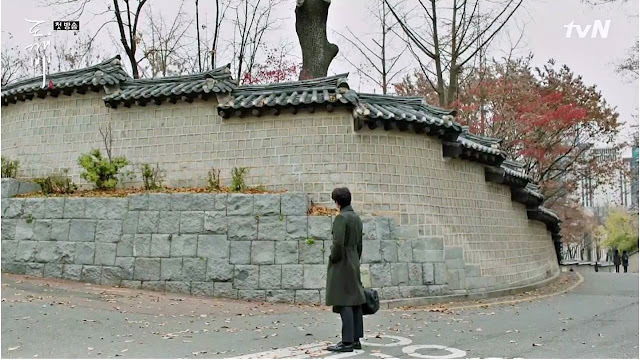 This stone wall road stretches from Deoksugung Palace from Seoul City Hall and ends at Jeongdong Theater. During Autumn, yellow ginkgo leaves takes center stage as they add color to the romantic ambience. 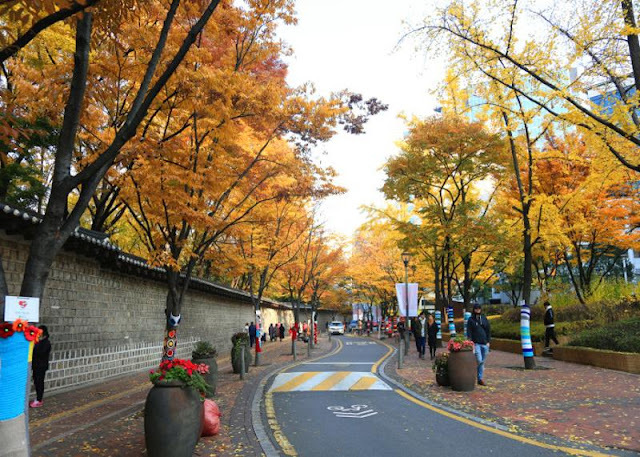 The Deoksugung Palace, National Museum of Modern and Contemporary Art - Deoksugung, Seoul Museum of Art and Jeongdong Theater are nearby to fill in your strolling in this lovely road. City Hall Station (Seoul Subway Line 1, 2), Exit 2. It is said that Samcheong-dong was named from the story about the three ‘cheong’ (Chinese character meaning ‘clean’) of the area, namely the mountain, water, and people. Samcheongdong-gil Road runs from the stone wall road of Gyeongbokgung Palace to Samcheong-dong. It passes through a variety of sceneries. Ginkgo trees paint the area with striking yellow hues. Sightseers can enjoy the palace, visit the National Folk Museum of Korea, and travel along the road through the autumn atmosphere. 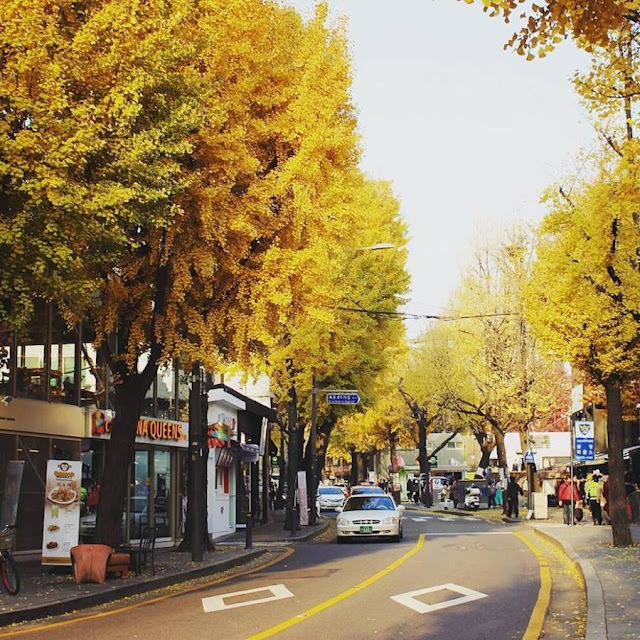 With so much to see, a walk along Samcheongdong-gil Road may take you half-day to finish. If you're adventurous enough to go out of Seoul, you have to check out the Jeonju Hanok Village in Jeollabuk-do. This traditional village in Jeonju gives visitors a glimpse of Korea's old way of life. To have greater feels, you may rent hanbok, Korea's traditional clothing, for as low as 10,000KRW (around Php 500). To get to Jeonju City, it takes around 35,000KRW and 2 hours by KTX to witness this autumn spectacle. At Jeonju station, you have to take a cab to reach Jeonju Hanok Village. - Get off at Jeondong Cathedral (Hanok Village) Bus Stop. 2) From Jeonju Intercity/Express Bus Terminal, take Bus No. 5-1 or 79. It takes about 15-20 minutes by taxi from Jeonju Station or Jeonju Bus Terminal to the Jeonju Hanok Village. Before going to these places, make sure you are dressed accordingly. Fashionable yet comfortable. If you don't know what to wear yet, check out our autumn fashion recommendations.